For more than 20 years, TouchNTuff® single use gloves have offered superior tactility, resilience and reliable protection from chemical splashes, making them ideal for a wide range of applications, including chemical handling, general industry, research, and pharmaceutical. Millions of workers do their jobs more effectively, comfortably, and safely thanks to the optimum protection offered by TouchNTuff gloves. Ultra-thin disposable gloves for jobs requiring tactility and fine motor control. Versatile disposable gloves that provide reliable protection for a range of jobs. Single-use gloves engineered for strength, endurance, and longer wear times for demanding work. Extended-cuff disposable gloves designed to offer extra protection for high-risk jobs. Clean and sterile gloves for use in cleanrooms and aseptic environments. The TouchNTuff 92-600 disposable nitrile glove offers proven splash resistance against hazardous chemicals. The TouchNTuff 93-250 nitrile disposable glove with Ansell Grip Technology offers confident grip and flexibility. 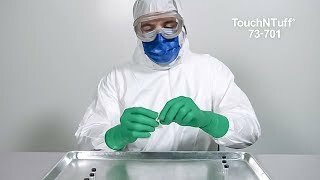 Learn why the TouchNTuff DermaShield 73-701 glove is the ideal glove for workers who need a high level of protection in aseptic environments. 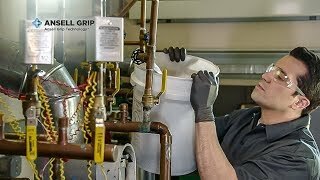 ANSELL GRIP is a coating treatment that minimizes the force required to grip dry, oily and wet tools or materials, reducing hand and arm fatigue while improving dexterity, safety and productivity. DERMASHIELD Technology is a proprietary inner coating for fast and easy damp or dry hand donning whether it is the first don or during intraoperative changes. ERGOFORM is a technology that enables Ansell to design safety solutions that support musculoskeletal health during repetitive tasks to improve worker performance. SENSOPRENE Technology delivers a glove up to 30% thinner than Ansell's standard neoprene surgical gloves so wearers' experience a high degree of sensitivity without compromising on durability and the optimum skin protection needed from allergies and sensitivities caused by latex or chemical accelerators. TNT is a proprietary polymer formulation that provides superior splash resistance against a wide range of hazardous chemicals, for durable protection with a soft, comfortable feel.